← QUARTER-LIFE CRISIS! Submission Deadline Extended to May 15, 2015! When Three Rooms Press throws a party, you’ll want be there. Come down tonight! Thursday, April 30 at 7 p.m. to The Gallery at Le Poisson Rouge for a magical night of networking, giveaways, and special readings from Three Rooms Press authors including mystery master Lawrence Block (editor, Dark City Lights), playwright/film director/poet Israel Horovitz (Heaven and Other Poems; My Old Lady), performance poet/musician Jane LeCroy (Signature Play), novelist/playwright Richard Vetere (The Writers Afterlife; Champagne and Cocaine), playwright Geoffrey Paul Gordon (Last Boat to Yokohama), and novelist/poet Meagan Brothers (Weird Girl and What’s His Name). 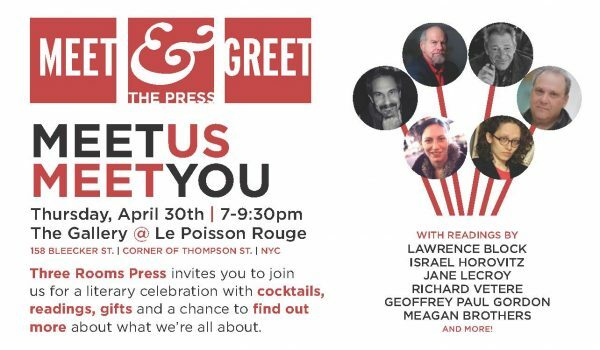 Plus meet 3RP co-directors Peter Carlaftes and Kat Georges, editor Constance Renfrow, and other authors from recent and forthcoming releases. Cocktails, giveaways, and fun! Find out more by dropping us an email at info@threeroomspress.com or RSVP on Facebook.